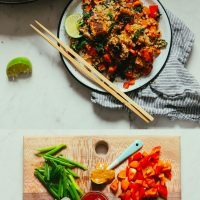 Everyone needs a good, classic stir fry recipe in their back pocket for quick lunches and dinners, and I think this should be the one. It comes together in just 30 minutes, uses up leftover grains and vegetables from the week, is rich in protein and fiber, and delivers big flavor. What’s not to love? Let me show you how easy it is to get this dish on the table. It all starts with marinating the tempeh. 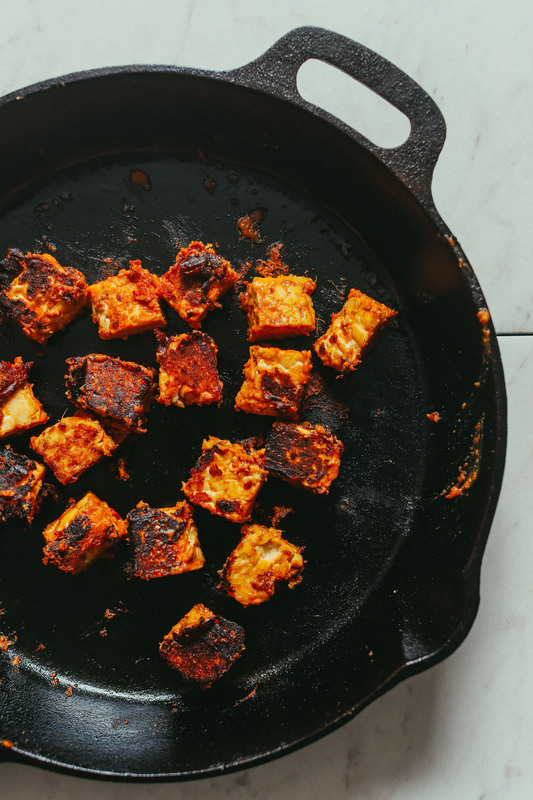 Cube your tempeh, mix with your peanut-coconut aminos (or tamari) glaze, and set aside. While that’s happening you’ll prep your other ingredients. Once marinated, sauté your tempeh on both sides until golden brown and delicious. Then you’ll add your veggies and grains and stir-fry until crispy and browned before adding your tempeh back to the pan to warm. That’s it! This would make the perfect weeknight meal when you want something hearty and nutritious on the table fast. I also love making it for lunch when I want something fast and filling. 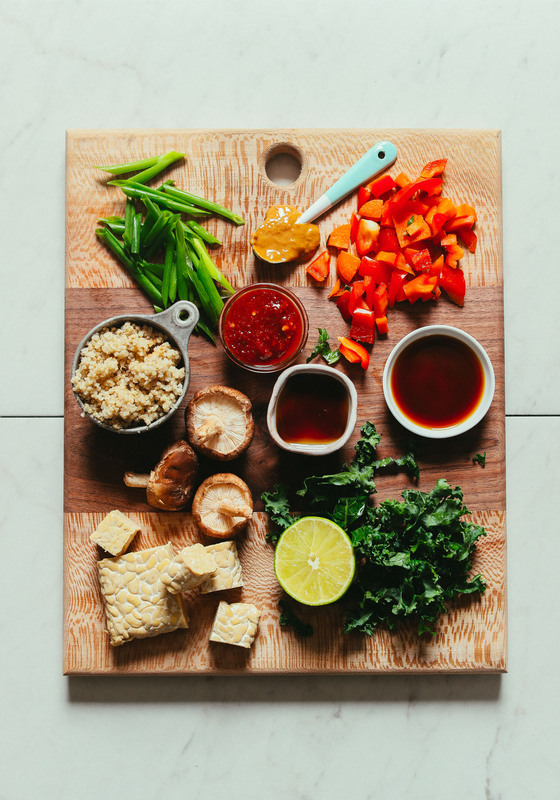 If you’re into stir fries, be sure to check out our Cauliflower Rice Stir-Fry, Quinoa “Fried Rice,” Almond Butter Tofu Stir-Fry, Tofu that Tastes Good Stir-Fry, and the fan favorite General Tso’s Tofu Stir-Fry! 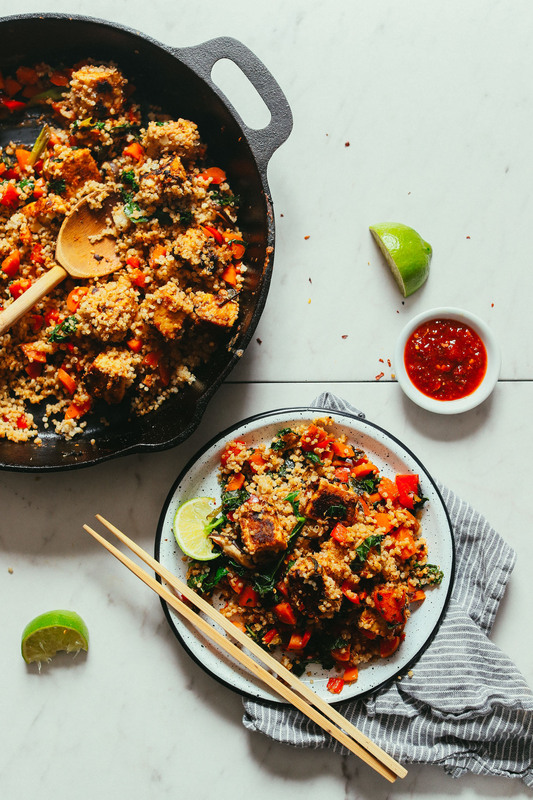 A hearty tempeh stir fry with BIG flavor! Just 30 minutes to prepare this weeknight dinner to use up leftover vegetables and please a crowd! Prepare glaze by adding chili garlic sauce, peanut butter, sesame oil, coconut aminos (or tamari), lime juice, fresh ginger, and maple syrup to a small mixing bowl. Whisk to combine. Add water until a thin, pourable sauce is formed. Taste and adjust flavor as needed, adding more chili garlic sauce for heat, maple syrup for sweetness, lime juice for acidity, or coconut aminos for saltiness. Don't be shy — you want this quite flavorful. Add the chopped tempeh to the glaze and toss to coat. Then cover and refrigerate for 15 minutes (or cover and refrigerate up to 24-48 hours). Prep your other vegetables and toppings at this time. Heat a large rimmed cast iron or metal skillet over medium heat. Once hot, spoon in the tempeh, reserving most of the glaze in the bowl (set aside for later). Sauté for 3-4 minutes, turning on each side until browned. Then remove from pan and set aside. To the still-hot skillet add sesame oil, green onion, and mixed vegetables (if adding greens, wait to add until step 6). Season with a bit of coconut aminos (or tamari) and stir to coat. Cover to cook and steam the vegetables, stirring occasionally until slightly golden brown and tender (about 4-5 minutes). If they stick to the pan, add 1-2 tsp of water to loosen. Once the vegetables are nearly done, add your greens and grains and sauté for 3-4 minutes or until warmed through and slightly browned. Then add in the cooked tempeh and the rest of the glaze and stir to coat. Cook for another 1-2 minutes, or until everything is hot and well incorporated. Store leftovers covered in the refrigerator up to 4-5 days. If freezing, store in the freezer up to 1 month. Let thaw before reheating in a hot skillet with a little sesame oil. *How to cook cauliflower rice, brown rice, and white rice. Super tasty. Made more marinade because we love sauce and used buckwheat noodles for starch. Thanks for sharing! Will make again. My 6 and 7 year old loved it! For the kids, added chili sauce at the table. This was incredible! Be warned if you, like me, have a fairly low tolerance for spicy food – I only used 2 tsp of chili garlic sauce, and that was just about as spicy as I could have possibly handled, but it was still DELICIOUS! I also used closer to 2 cups of quinoa instead of 3 because the proportions looked about right at 2, which could have been a factor in the spiciness level. Overall though, what a flavorful, healthy, and filling meal! I used tofu instead of tempeh because that is what I had on hand but the recipe was amazing! My boyfriend and I both loved the sauce. Will be one of our favorites. Excited to try again but with tempeh. This was so delicious! I added bok choy instead of kale, soy sauce instead of coconut aminos (I was out) and only added 2 tsp of chilli garlic sauce and found it to be the perfect level of spice. Thank you for the amazing recipe! Your recipes never fail me! If using cauliflower rice, at what point do you add it in? In step 6 in place of the grains. Hope that helps! Making this for second time tonight. My husband and 3yo son loved it! I omitted the chili sauce b/c my son won’t eat anything remotely spicy, but otherwise pretty much followed the recipe. This recipe us absolutely fabulous and I plan on serving this to my non-vegan friends. Thank you so much ! Delicious, easy and fairly quick to come together and all ingredients I usually have on hand. This is a keeper for me and would be tasty with any veggie combos you could dream up. I make this with tofu instead of tempeh. Yum. I found this recipe a couple weeks ago and it is my new favorite. Its healthy, quick, tastes great and works well for either lunch or dinner. I love adding Kim chi and cashew mayo to mine. Thanks for the recipe! A solid weeknight dinner recipe. I’d add a little more peanut sauce next time. I pretty much followed the recipe, but minced a garlic clove and added red pepper flakes in lieu of the garlic-chili sauce, and subbed a smaller amount of tamari for the coconut aminos. OMG. I made this for dinner last night and it was amazing. Mixed it with cauliflower rice and this was one of the best meals ever! I normally am not the biggest fan of tempeh but I let it soak in the sauce Overnight and that made a world of a difference. My husband and I were scraping our bowls to get every morsel out. Excellent recipe . I used brown rice instead of quinoa and it was AMAZING! Thanks so much! I made this, and I absolutely love it. HIGHLY RECOMMEND!! My adjustments were minor: I omitted the sesame oil, used tamari instead of coconut aminos (as my aminos were flavoured) and used baby spinach instead of kale. I’m making this again today, and will use kale, but the baby spinach works really well too. I love recipes like this, meals that can be used for lunch or dinner, and made in bulk for meal prep. I would love to see more of these. Thank you!! Love all your amazing recipes, so thank you so much. Had the cauliflower dahl 3x in the last week haha! 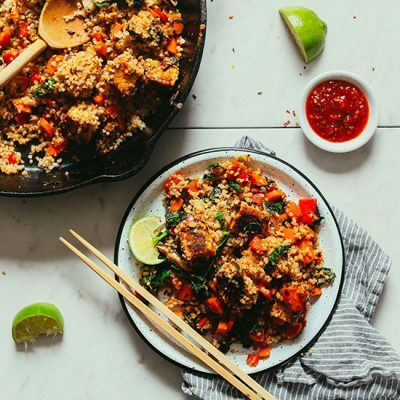 Just about to make this tempeh dish for our dinner tonight, but I don’t have the chili garlic sauce, can you tell me how to make some please and thanks. Made this as the recipe stated, and it was Delicious! Spicy, tasty, very satisfying. My mega-carnivore husband repeatedly said he liked it and would like to have it again. Wonderful! The sauce/glaze is so yummy that I’ll probably increase the amount next time (although will leave the heat the same–it was perfect). Thank you! This recipe was super simple, and SO DELICIOUS! I even messed up by under-cooking my rice, and I still ate the whole bowl because everything else was so yummy. I will DEFINITELY be making this again, in the very near future. I made this as directed, (used almond buttter and rice)and it tasted good. But.,,,strongly recommend that the tempeh is cut into small cubes – no more than an inch square. Due to the marinade, it blackens easily, so lower heat a bit. I have had more sucess browning the tempeh first, and then marinating. My vegan family was not impressed. Has anyone tried it with uncooked cauliflower and why uncooked? I have always been suspicious of tempeh, so bland, so naaaahhh, but this recipe of yours just NAILED IT! Oh I can’t stop eating, it’s so delicious. The layering of flavours is just perfect. I used more vegetables: bok chow, red pepper, broccoli, green onions and kale. I overcooked the kale (darn) so I won’t be posting a picture anywhere because the colours are a bit off, but the flavour is to die for. My stovetop is now a mess but it’s so worth it!!! You’re the very best, Dana. We’re so glad you enjoyed it, Helen! My husband and I both loved this. We marinated the tempeh for the minimum time, used a little extra chili garlic sauce, and choose red bell pepper, shredded carrots, broccoli, spinach, and shiitake mushrooms for our vegetables. We probably had 5-6 cups of vegetables rather than the 4 and it worked well other than my 10-inch see was almost overflowing. This is going to be a go-to easy, healthy meal for us. Oh and I used cauliflower rice, which I will plan to always do in the future — it was perfect! Yes. You mix it in near the end and cook it for a few minutes and it works well. This is a fantastic recipe. Super easy to make and will definitely be one I keep returning too. Thanks Dana! Recipe was alot easier to make than I thought it would be. My husband is a meat and potatoes man and recently agreed to “lean” into plant based. He’s been open minded and has been trying, tho I can see it’s not his favorite. However last night he got up from his seat walked around the table and kissed me. He said this is the best thing I’ve made since we started this way of eating. He LOVED the flavors in it and said it’s a definite make again meal! Holy moly this is delicious! I made it as is and honestly wouldn’t change a thing. Love this recipe, husband loves anything with peanut sauce. Made enough to freeze, I do lots of batch cooking. This is a keeper! I made this for my meal prep this week and I’m already out. I loved it! Only thing I did different is sub sesame oil for water. I made this but I didn’t have limes so I used lemon juice. It wasn’t the taste that I wanted so I used some coconut amino vinegar and that did the trick. This recipe is a keeper for sure! My husband loves it and that’s great. Hello, what type of tempe do you use? Where do you buy it? It isn’t available at my local grocery stores but I will go Whole Foods tomorrow. We find that Lightlife and Tofurky are both good brands. We have been able to locate these brands at Whole Foods. Be sure to check the package for gluten-free friendly, if needed. I followed the recipe exactly and it was perfect. I never would have pan fried something with a peanut sauce before but it turned out really nice. Thank you! We’re glad you enjoyed the recipe, Alex! 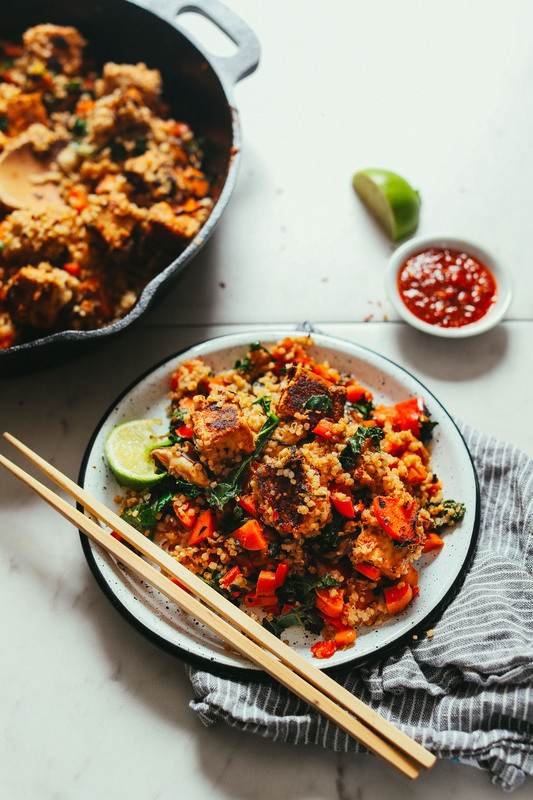 Made this with cauliflower rice and loved the flavor! 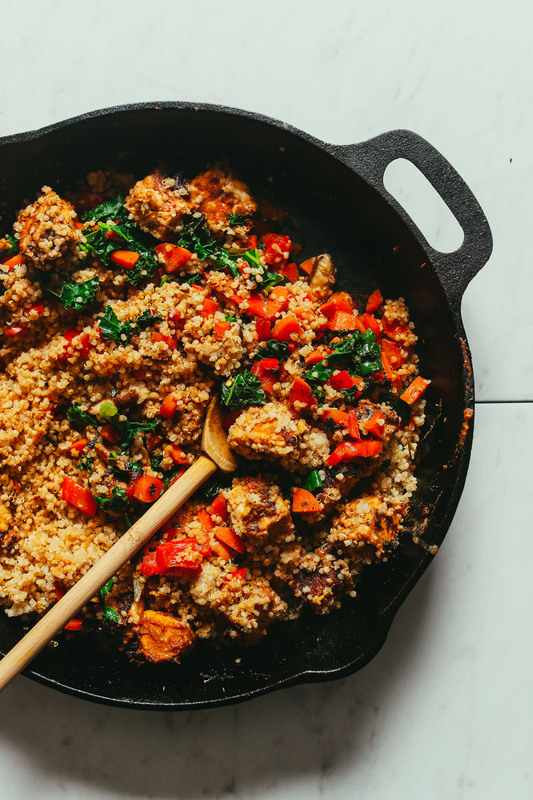 Are your nutrition facts for a serving made with quinoa? Sorry if its written up there but i missed this somewhere!! It’s calculated with all of the quinoa. I made this the other night. Substituted tofu for tempeh it was delicious and very easy. Dana, you did it again girlfriend! This was delicious. Definitely going to be one of my new go-to’s whenever I have leftover grains to use up. Thank you!!! Made this with PB2 instead of peanut butter and no oil to fit my macros, and it was so good! I used 1 Cup extra veggies instead of tempeh, and leftover cooked millet. I used 1 Tbsp sriracha sauce to save time and apple cider vinegar (I forgot to buy a lime). Was delicious! Thanks! Subbed Chicken for tempeh because I’m allergic to soy and it was great and simple! Glad you liked it! Thanks for sharing Emaleigh! This recipe was totally amazing. Thanks a lot, I loved it. The only thing I subbed was the coconut aminos (which I didn’t have) but I used tamari and it was perfect. Definitely a recipe I’m going to do on a regular basis! Great! Thanks for sharing, Charles! Omigosh, so so so delicious! I had several bowls even though my belly was about to explode! My husband loved it, too. He asked me what the secret sauce was. Thanks so much for another amazing recipe! This was AMAZING. I used tamari and it somehow was too salty but tasted amazing on the quinoa/brown rice mixture I made. The veggies I used were rainbow carrots, chopped kale, mushrooms, zucchini (I forgot onion). I’m adding this to my weekly recipes. I’ve only ever had tempeh this good one other time. It charred quickly in the stainless steel pan I had on medium high heat w cooking spray and was phenomenal. Great recipe!! I also used no oil and substituted water and was very flavorful. I also used stevia in place of the maple syrup. I just want to say that I love the recipe interface. The ability to switch to metric, and the inclusion of info on keep and freeze times is just brilliant. Thanks! A quick question: Will there be a great loss of flavour if the sesame oil is omitted? If so, can you recommend something to replace the flavour? (This saves me 120 calories per serve). Yay! Glad you like that! Sesame oil does add flavor but it’s not critical. Hope that helps! This was yummy! A bit longer than 30 minutes (closer to 60), but that’s mainly because I’m quite a slow cook. Since I’m not vegan or gf, I used soy sauce and honey in place of coconut aminos and maple syrup. I also subbed 2 garlic cloves and a teaspoon of red pepper flakes for the chili garlic sauce. Super delicious! Thanks for sharing, Claire! Glad you enjoyed it. xoxo! My two year old and I are chowing down on this right now and enjoying it immensely! Since hubbie isn’t a fan of soy I subbed with “chicken” seitan and then used onions and broccoli for the veggies. It goes beautifully with quinoa and has a nice spice to it (so I’m especially pleased that the baby likes it). Definitely a repeat dish! Yay! We’re so glad you enjoyed it, Pam! I made this tonight with noodles. So good! This recipe is a keeper. Thanks, Colleen! Next time would you mind adding a rating to your review? It’s super helpful for us and other readers. xoxo! Is nutrition info calculated with rice or without? LOVE tempeh, cannot wait to try! Made for dinner tonight, subbed tofu for tempeh, and soy sauce for aminos. So good! Came together really fast. A definite keeper, thank you! Made this tonight with tofu instead of tempeh (marinated for about 4 hrs, stirfried for about 10-12 min) and celery instead of green onions, and it was wonderful! Hi Claudia :) you don’t necessarily have to boil or steam tempeh before use. Some people recommend this because it can help counteract some of the natural bitterness that tempeh has. You can definitely do this if you would like, but I’m guessing with the bold flavors of the glaze in this recipe it’s probably not necessary. You could substitute tofu if you’re able to get that. 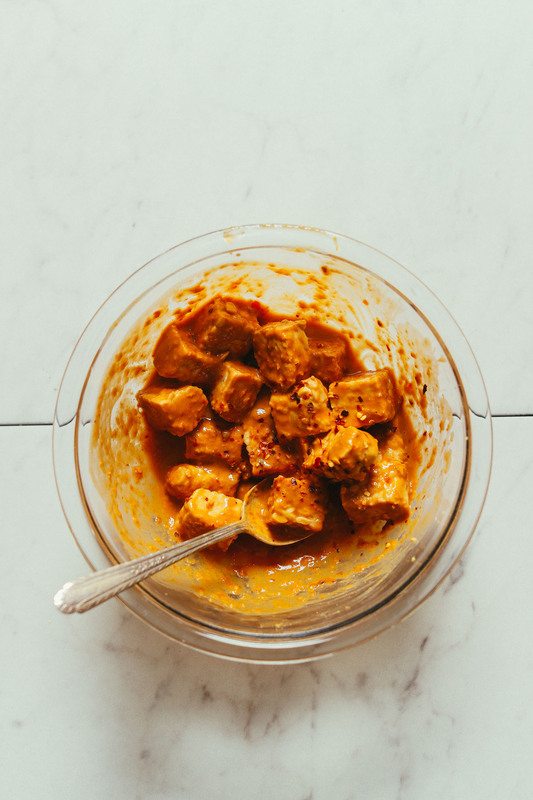 If not, you could try making Burmese tofu from scratch, which is just made from chickpea flour and water. Otherwise, you could definitely substitute chickpeas. Thanks for sharing, Casey! I agree tofu would be great here. Otherwise chickpeas (or most legumes), extra quinoa, extra veggies, or hemp seeds! For chili garlic sauce, you could use sriracha. Or even just some chili flakes and minced garlic. Chili garlic sauce is basically just a mix of vinegar, chili flakes, garlic paste, and sometimes a little sugar. You can easily DIY it if you want :) for maple syrup you could substitute any liquid sweetener, like honey, brown rice syrup, coconut nectar, agave nectar, etc. If you can’t get ahold of any of those, you could probably just use a little bit of brown sugar. This looks delicious! I will report back in a few days after I make it! Thanks Dana. I thought you should boil the tempeh before you use it… it’s not necessary for this recipe? P.S. Dana, this looks delicious. Definitely going into my rotation! You don’t need to boil tempeh! It just needs to be cooked, which you do when sautéing. If you want though, you can steam it for 10 minutes, which supposedly helps remove some of the bitterness. But, it’s totally optional.